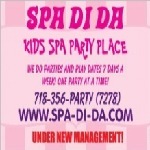 Spa-Di-Da, Staten Island, United States - Day Spa in Staten Island, NY. Spa-Di-Da - Day Spa in Staten Island, NY. What is more wonderful than planning your little princess's birthday in Hollywood style spa elegantly decorated affable staff who also offers marvellous services like children's activities , Children's pedicure and a perfect venue for her birthday.